I just wanted to pass along my sincere appreciation to Kathleen, she officiated my son Griffin Douglas' wedding September 27, 2014. She was fantastic, fun, PATIENT with our delays and just a true delight! I would recommend her to anyone getting married. She was an absolutely lovely person. Please pass along our gratitude. What can we say about you? You were phenomenal, outstanding...words fail. We were so impressed at how you helped the boys unpuzzle the whole attaching the boutonniere issue, to helping our photographer out by getting people to look at the camera, and the ceremony was beautiful, you were lots of fun and we had some good laughs. Wedding days should be fun because it is the beginning of getting to really learn to laugh at life. 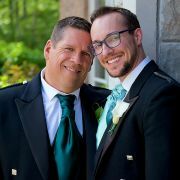 Kathleen Everett , Kevin and I want to thank you, we loved our wedding day and you being a part of that day made it even better. Dear Kathleen, Thank you for being such an important part of our special day! We had no idea there would be so many little details to remember, but you made it all so easy - from all of the advice and guidance leading up to the ceremony, to such practical things like having readings and vows printed out and ready for us. Our wedding ceremony is a memory that we will cherish forever, and you were an integral part of it! Attached is a photo of the ceremony taken by one of our wedding guests - you will see that we are all laughing, which reflects the mood of the day. Thanks again! Kathleen was such an important part of our wedding day. Her support throughout the process was valuable and she performed the ceremony beautifully. 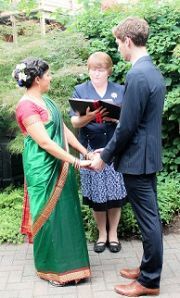 Her calm and easygoing nature helped create a lovely and serene atmosphere for our small ceremony. We especially appreciated how Kathleen kept things light at the beginning - it helped to calm our nerves a little bit! We cannot thank her enough! Our experience was nothing short of wonderful. 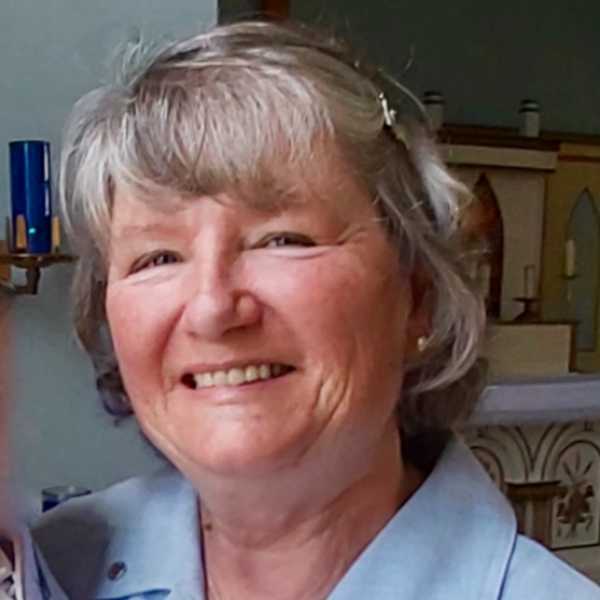 We are very greatful to Kathleen for making it OUR special day and not just a cookie cutter wedding - We even have guests telling us how much they enjoyed her! Kathleen went above and beyond! Our officiant Kathleen Everett was wonderful ! Never having met her due to being out of town we were worried but she was the most wonderful woman ever! She made our day unforgettable and had so many great ideas to make our ceremony one of a kind. Kathleen Everett was excellent. Even family complimented us on how she was a perfect fit with our celebration. 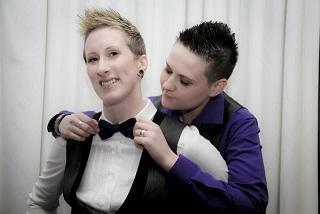 Our ceremony was perfect and it reflected everything about who we are. Kathleen was the perfect officiant who was able to integrate the unique moments our little girls offered to make our ceremony about "us" as family. We couldn't have dreamed of a better ceremony or day to start our "happily ever after". We had a GREAT time despite the heat, and you kept everything short and sweet, just like we wanted. But most importantly, you made me feel comfortable, which was what mattered most to me. Thanks to you, the atmosphere was very relaxed and laid back, and for that we are very grateful. We couldn’t have asked for better service! Feel free to use one of our pics on your web site. And no, we would not hesitate to recommend you to other couples. In fact, we already have! Take care and thanks again! Thank YOU so much Kathleen for the beautiful ceremony. We also received many compliments on your behalf. I am not sure how I managed to hold my tears back; I tried to focus on you and Jason only but many others admitted to teary eyes...even some guys!!! We thought that the whole day was perfect :) Over all a stressFREE and fun time when among such wonderful people. The love vibes were very strong indeed. Thank you again for being with us in such a big way on our day! 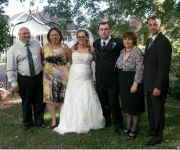 It meant a lot to our family to have you officiate our wedding. Dear Kathleen, Thank you so much for performing our wedding ceremony! Your kind demeanour, attention to detail, and encouragement to create the ceremony we dreamed of, was exactly what we were looking for. The blending of two cultures/religions isn't always easy, but we (and even more importantly, our families) were thrilled with how it turned out! We had the perfect day, thanks for being an important part of it! We hope to see you again soon! 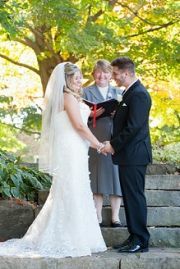 Kathleen, you exceeded our expectations and gave us the ceremony we dreamed of. It was an absolute pleasure working with you. Thank you for making our day a memorable and perfect celebration. Kathleen went above and beyond. 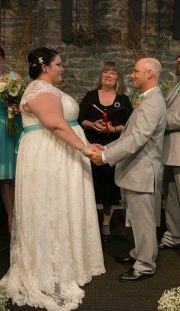 We had quite a huge setback when our first officiant cancelled three weeks before our wedding. My fiancee called, understandably crying, and Kathleen answered. She calmed her down and offered to meet us the very next day. We met her and she went over the entire process, which we wouldn't have been provided with our original officiant. She took over our wedding was wonderful and we don't know what we would have done if she hadn't been so accommodating. She calmed our nerves and let us focus on the wedding, not on who would marry us. We also received plenty of nice comments about her after the wedding. She was charming and super helpful throughout the entire process. Thank you so much for making our day so special and run smoothly. You helped ease any stress/nervousness with your calm and soothing words. You made everyone feel welcome and comfortable Our day went off without a hitch, minus Shawna and I getting hitched that is haha. Thanks again from the bottom of our hearts. Hi Kathleen, Apologies for my delay - it has been amazingly a very busy month. I really want to thank you for the time you took with us, initially in getting our ceremony together, as well as the day of. You read such a beautiful ceremony and had such a calming presence for me. I know Andrew also really enjoyed having you there, and so many friends and family have spoken so highly of the ceremony you gave and the humour you put throughout the ceremony. 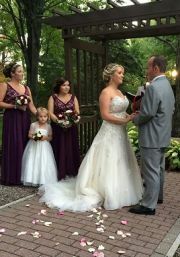 Thank you so much for sharing such a special moment with Andrew and I.
Kathleen (Everett) was an excellent officiant and I would recommend her to anyone. She was professional and efficient, and also friendly and kind in walking us through the process. She made some great suggestions for our ceremony. She was well spoken and clear and we received many compliments on our ceremony. I felt in very good hands and had nothing to worry about leading up to our wedding ceremony!! Thank you so much for everything Kathleen! Thank you so much for all of your help with our wedding this past June. Kathleen was amazing! She helped us get everything ready at the rehearsal and she helped keep my husband relaxed during the ceremony even though he was really nervous. I would highly recommend both this service and Kathleen to anyone who is getting married. Everything regarding booking and payment was so easy. Zero complaints. Thank you so much for helping make our special day perfect. We had a fantastic experience with Kathleen Everett. My fiance and I couldn't be happier with our wedding ceremony! Kathleen was amazing and we are so happy we chose her. Leading up to the ceremony, Kathleen was very accommodating, even when I wanted to make last minute changes, and was so easy to communicate with! During the ceremony, despite the intense heat, Kathleen was so pleasant and relaxed and she made sure I was relaxed as well. The ceremony was beautiful and it was exactly what we wanted! Thank you Kathleen. Hello Kathleen (Everett), We wanted to say thank you from the bottom of our hearts for the beautiful ceremony you put on for us September 15th. Although it was hot as ever, you remained calm, cool and collected as we proceeded through the ceremony. Thank you for all of your help along the way in preparing us for the big day! You were amazing and your help (and all your wedding day tips and tricks) was extremely appreciated. We have received countless compliments on the beautiful ceremony.